Being Frugal and Making It Work: FREE Scotch-Brite Greener Clean Scrub Sponge! 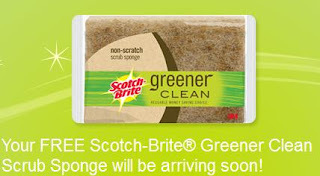 Get your FREE Scotch-Brite Greener Clean Scrub Sponge that outlasts 30 rolls of paper towels! All you have to do is hurry on over to their Facebook page and "like" them. Then, simply fill out the quick and easy form and your FREE scrub sponge will be on its way! HURRY! There are only 100,000 available and they won't last long!